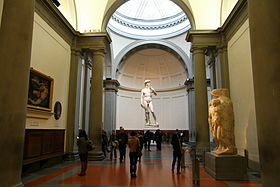 The Galleria dell'Accademia di Firenze, or "Gallery of the Academy of Florence", is an art museum in Florence, Italy. It is the home of Michelangelo's sculpture David. It also has other sculptures by Michelangelo and a collection of Renaissance paintings. It adjoins the Accademia di Belle Arti or academy of fine arts of Florence, but despite the name has no other connection with it. This article uses material from the Wikipedia article "Gallery of the Academy of Florence", which is released under the Creative Commons Attribution-Share-Alike 3.0 License.